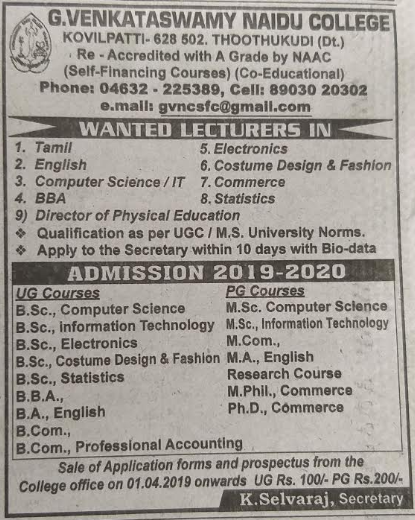 G.Venkataswamy Naidu College, Kovilpatti has advertised in the DINATHANTHI newspaper for the recruitment of Teaching Faculty- Lecturers / Physical Education Director jobs vacancies. Interested and eligible job aspirants are requested to apply immediately from 01st April 2019. Check out further more details below. About College: The idea of starting a college at kovilpatti was mooted on 29 April,1966 by the auspices of the G.Kuppuswamy Naidu Charity Trust for Education and Medical Relief.The college was formally inaugurated on 17 July, 1966 by Honorable Mr. M.Bakthvatsalam, chief-minister of madras.